Dynaudio Confidence sound pack review - VW Passat | What Hi-Fi? If you’re familiar with Dynaudio’s different speaker ranges, you're already half-way to understanding how the hierarchy of its in-car sound systems too. We've already experienced Excite in the VW Golf Mk7, and it’s fair to say we were very impressed. With a £525 price tag (let's call this entry-level for arguments sake), we felt it was well worth passing on the furry dice and go faster stripes in favour of the upgraded sound system. Now we've stepped up a level, moving from VW’s sporty hatchback to the more executive Passat saloon. This also means we get the option of a higher-grade sound set-up, named after Dynaudio's high-end speaker range, Confidence. Over the years we’ve reviewed, (and been entertained by), speakers such as the £11,800 Confidence C2 Signature and the £5325 Confidence C1. So in theory, £885 for a complete in-car sound system sounds like a bargain, no? Confidence sees 12 speakers squeezed into the Passat's body. There are two three-way speaker set-ups in the front of the car, and a pair of two-way speakers in the rear. A subwoofer is mounted where the spare wheel usually sits and there’s also a centre speaker mounted in the top of the dashboard (something the Golf’s Excite system lacks). Power is provided by a 700W digital amplifier. The tweeters are all of the soft-dome variety, while the mid/bass drivers are made from MSP (Magnesium Silicate Polymer). The system includes an 8in touchscreen display, which is still up there with some of the best in-car interfaces we've tested. It’s a smart little unit which, we find, responds much more quickly and positively to your prompts than systems found in current Jaguar, Range Rover and Porsche models. There’s plenty of room for on-screen icons to breathe and for your fingers to stretch out. Granted, the glossy, quick-fire reactions of an Apple iPad Air 2 or Samsung Galaxy S6 leave it for dead, but few if any in-car systems out there live up to these expectations. The addition of a proximity sensor to the screen brings a different dimension to the way you interact - and it's all the better for it. Waft your hand towards the screen, as if you're about to switch source or want to tinker with set-up, and the tabs at the bottom of the screen are blown up in size, making them easier to access. Move your hand away and the display reverts back to its original layout. This may seem a somwhat trivial thing, but in practice it's a neat little party trick which means the screen isn’t overrun with unecessary (and potentially distracting) tabs and menus. Contrast this with the 'virtual cockpit' system found in new Audi TT, where there's no screen in the centre console - the only display in the car doubles up as the dashboard, right in the line of sight for the driver. While this is a modern twist on the traditional dash layout, it's also quite restrictive and can reduce your passenger to the role of bystander, as the driver has all the fun. It’s rare to come across an in-car system that sounds good from the first time you slip into the driver’s seat and switch on the ignition. Just as with a home hi-fi system, an in-car hi-fi requires an element of set-up and running in before they can performing at their peak. As with any in-car sound system, play around with the bass, midrange and treble settings. Tinker with the subwoofer level and any stereo/surround settings until you reach a balance you’re happy with. 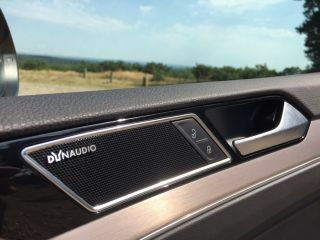 In the Passat, Dynaudio and VW provide a number of options to fine-tune the sound in the cabin. Tap the set-up cogs on the screen and you can navigate your way to the relevant sound settings. Dynaudio sound character gives you five options: Authentic, Soft, Dynamic, Speech and Individual. 'Authentic' results in a very natural tone, laid back without sounding comatosed. Highs sound refined, lows solid and precise, but it's still lively enough to get your feet tapping along. 'Soft' sounds just that. It's the safest balance, which Dynaudio recommends for Bluetooth streaming and MP3 playback. The downside is that you sacrifice something of dynamics and bite - it's as if the music has been wrapped in cotton wool and can't quite cut itself free. Soft does, however, ease those brittle highs when you’re streaming wirelessly. Still, if you’re hooked up directly to the system, playing a CD or listening to the radio, we'd opt for authentic or dynamic. Speaking of which, 'Dynamic' is the most exciting, punchy and potent of all the settings. There's real slam to the tight, relatively agile bass notes, and reach in the treble without any break up or the sound veering to coarse. Over time some might find it tiring, though, and you might need to rein in the bass a couple of notches. 'Speech', unsurprisingly, concentrates on voices, isolating them in the soundstage and recessing the rest of the information. While it's okay for dialogue-heavy radio stations or audiobooks, we'd definitely recommend switching back to one of the other settings when you're in a musical mood. The last option, 'Individual' allows you to indulge in a spot of tweakery, making adjustments to bass, mid-range and treble. Once you've settled for a general sound character, there are also a number of surround modes to choose from (wide, small and stereo) which either use the centre channel or take it out of the equation depending on your choice. We'd plump for wide - small in particular seems to shrink the soundstage. Dynaudio sound focus gives you the option of selecting presets optimised for different sitting positions, depending on whether you’ve got passengers. You can focus the music to the left, to the right, to the rear and both front and rear - there isn’t a Front L and Front R configuration, which you might think would be more relevant. We were impressed by the Golf's Excite sytem, and the Confidence takes everything we liked and adds even more polish. The tone and blance are very similar - detailed, dynamic and honest-sounding - but there's a greater sense of scale and you get the impression the system is digging out even more detail. The addition of a centre speaker definitely helps to spread the sound for driver and passenger. It helps to create a more convincing soundstage, or as close as you can get to one in an in-car environment - in some systems it can feel as though music is coming from only one side of the car. We play Jamie T's Stick 'n' Stones and the system gets off on the front foot. Drum thwacks are tight and sharply defined, while the playful bassline bobs up and down as the track rolls slong. The sytem does a fine job of keeping up with the lively pace of the track. Jamie's vocal is expressive and he delivers a steady lyrical stream which follows the path laid by the rest of the tune. Switch to a more intimate track such as the acoustic version of Birdy's Wings, and the system handles the subtleties well. It's easy to hear nuances from the acoustic guitar and piano. Even the subtle dynamic shifts in the vocal can be heard clearly, with the only noise audible coming from the contact between tyre and asphalt. Dynaudio's obviously put a lot of effort into this in-car system. Not only does it sound great by modern standards, it's also relatively affordable in the grand scheme of in-car options. It's more expensive than the Excite model you can configre for the Golf, but that wouldn't stop us ticking the box with Confidence.